While a wind of change is blowing through French pop-culture, a new group is breaking all the rules. 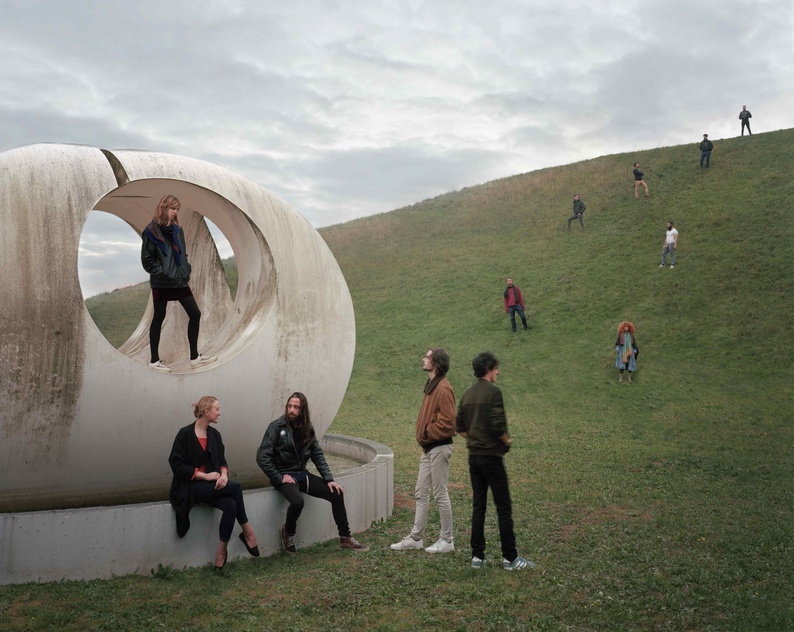 After a book and an album, the multifaceted collective "Catastrophe" focus their music and performances on the upheaval taking place within French youth culture, which is stuck in time but craves revival. We followed them for a night to find out what the music of tomorrow sounds like. Pierre is daydreaming. Sitting in his chair, his jaw drops as he witnesses a man with a top hat floating through the room. As he pinches himself, he contemplates the numerous details of the Jack Rabbit Slim’s look-a-like decor, the bar where John Travolta and Uma Thurman dance in Pulp Fiction. We are at the Balajo—known for its century-old tradition of partying—in the 11th district of Paris. The evening has only just begun and the place already radiates an aura that can only be described as retro-kitsch: red seats, disco balls and pink neon everywhere. Tonight, the Balajo is welcoming Radiooooo.com, an online platform that catalogues music from all countries and decades, starting as far back as 1910. To celebrate this event, the man dressed up as the Mad Hatter and his friends have invited young and upcoming bands to play a few covers. Pierre and his band, Catastrophe, are scheduled to perform Dragostea din tei by the Moldovan group O-Zone at the end of the evening. For the occasion, the members of the group are dressed in the styles of the early 2000s. Pierre is wearing a loose multi-couloured jacket, Blandine has opted for a fitness outfit with a zipper in the front and Bastien has grown out his moustache. In total, they will be performing with six band members. In theory, the band is bigger than that, but in reality no one really knows how many people are part of the collective. True to its name, Catastrophe took the French pop-culture scene by storm. It all started after they published an article entitled Everything is allowed since it is all over in the French daily Libération. They followed that with the publication of a manifesto-like book called The night is still young. On the 19th of January 2018, Catastrophe released a self-titled album with 14 tracks, which has had critics swaying between wonder and dismay ever since its release. Behind the mysteriousness of Catastrophe appears to be a diverse and young collective with a clear goal: to have a _rendez-vous_ with the future. Dressed in a white suit, Arthur tells us that he quit his job two weeks ago. He used to work in the live entertainment industry, but "it's really booming. You can feel there's a lot of hype about it all, so I decided to dedicate all my time to it." According to Blandine, it's one of Catastrophe's characteristics: "Many of us quit our jobs or studies. Being "deserters" is what we have in common." For now, it's difficult to gauge their success. The book is not a bestseller, and it's too early to assess the success of the album, but Catastrophe has a plethora of tour-dates lined up in France and Germany. All their venues have been carefully selected: school halls and small theatres, mostly in the suburbs. "Catastrophe wants to connect with the crowd differently. The places we choose to perform must echo what we want to express." The Balajo seems to fit the bill; during the sound check, the old cabaret lounge beautifully echoes the atmosphere of their cover of Dragonstea din tei. Subtle chords, high notes, whispers. All of a sudden, O-Zone sounds like lounge music. "It's this sort of sensitivity that we've chosen to put forth," Hadrien explains while lighting a cigarette. "After all, 'Dragonstea din tei' means "Love in limetrees". Right from the start, Catastrophe seemed to embody another era. In this bar in Bastille, the group looks like a bunch of friends who have chosen to be an anachronism. They are far away from their HQ in the 18th district—"An oddly situated bar in front of the BNP bank"—where the atmosphere is messy, the people look different and the pints are cheap. Here, in upscale Bastille, the members of Catastrophe reminisce about nights out and make fun of old sayings like "easy peasy"—"Tranquilou bilou"—while enjoying some cheese and toast. "We haven't actually known each other for that long," says Hadrien while wiping his mouth. "I think above all, a certain sense of humour is what we have in common," Pierre carries on. But don't be mistaken by their casual demeanour; Catastrophe has turned some heads, for better or worse. In September 2016, after Catastrophe published their article in Libération, an online music magazine attacked them without mercy. The article, which has since then been taken down, accused them of being "a promotional company", and "junk situationists", and described them as a cluster of teenagers who take themselves too seriously to deserve any serious attention. Years later, it's still a sensitive issue. "Do we really still have to talk about that?" Blandine says annoyedly. At the time, it brought her to tears. "I admit we can be clumsy, but we aren't deceitful." So what is this all about? About free expression and a couple of paragraphs, which "we owed to ourselves," the authors explain. A critique on an era in "a state of vegetative death" ruled by "Mrs Debt and Mrs Crisis" and other "personalities that are already dead", like anti-heroes such as Michel Houellebecq and Frédéric Beigbeider. From this analysis follows a call to action: "to be reborn" and free ourselves from everything that constitutes today's generation: system D, "digital vegetable patches", and multitask jobs. "A lot of people wrote to us saying they saw themselves in what we wrote and telling us that we should act together," Blandine continues. "But we feel fragile." After facing criticism, the group published a book entitled Paying attention to words. "Criticism does teach you a few things", Pierre admits. Published in September 2017, The night is still young was written in a single night and is comprised of 66 chapters, each shorter than the previous one. More poetic and airy than the article they wrote, it contains a diverse array of memories, like 9/11, a disillusioned aunt and a car accident, new concepts like "Occhiolism" and quite a few literary references, to authors such as Tristan Garcia and Robert Musil. "The idea was to talk about a new beginning, a future," the group explains. "There is also a chapter dedicated to ordinary people." An answer to individualism? "Yes, maybe", Blandine answers. "I was taught to be an individualist at school, where I had to make my CV and I had to put my name on everything I did." This is the reason they don't sign their work with their personal names "In the group, there are five people that sing, but you never know who is who," Arthur explains. After the pints and platters, Hadrien suggests we "go get a bottle and sit in the park." Since it's January, it's only 2°C in Paris and Pierre suggests we rather go to "a quiet candle-lit bar, where we can hear each other." We follow Arthur through the dark streets of Bastille while Blandine tells me about the existing divisions within the group: an insensitive joke, a political reference, the fact that someone might find the 16th district charming. But in the end, nothing can break them up. Without Hadrien there, the rest of Catastrophe is reunited in the Badaboum, a bar in the 11th district which is forced to raise the price of their drinks. With his 4 euro Ricard, however, Pierre is happy to be in a calm place with dim candles on the table. Less so when it comes to addressing the overarching theme of the evening, which is also very present in their projects. "We are part of something that is much bigger than we are," Blandine explains. "But you can't reduce everything to one entity." Mathilde lights another candle. "We are fed up with all these articles about how "the younger generation is making a change" or "the younger generation is so disruptive." "On the one hand, the youth is degenerated and on the other one, it is supposedly fighting. We are being used and, above all, we find ourselves in neither category." "X, Y, Z... Isn't that funny, the letters of the next generations are the last letters of the alphabet. So what happens after, will we all fall into a black hole?" Blandine wonders. "All of our parents told us life is not easy. But by repeating that, the urge for a different life is growing within us." According to the collective, the media's image of today's youth harms their relationship with their parents, who don't understand what they are doing. "As became clear in an article in Le Monde". "It's a shame," Blandine sighs, "because there's an enormous amount of people with great ideas, but there is no one to represent them. I can see that people are really trying to do their best"
Arthur tells us about the difficulties he faced when he arrived in Paris from his home town in Centre-Val-De-Loire. Born in Chartres to a working-class family and "in a town where there was only a cathedral," he decided to come to Paris at the age of 17. For a while, he lived on just 150 euros a month. "I used to go out with my mates all night, and during the day I used to sleep at university," he tells us. "Paris can be a pain, man." He met Pierre and Blandine through some friends they had in common. Together, they hosted a radio show in a school building, The Carl Poppers Show, in which they would have a conversation while high on poppers. The idea was to share a strange moment with someone you didn't know. The surprising setting creates new sources of conversation," Pierre tells us. Once, they invited Bertrand Burgalat, who became a celebrity in the Parisian music scene after founding his own record label, Tricatel. Afterwards, they stayed in touch and eventually, Catastrophe's album was released by Tricatel and produced by Burgalat. A self-fulfilling prophecy? "Not at all," Pierre retorts. "Bertrand is a mirror. Everything we see in him is our reflection. Pierre, who studied at the music conservatory, wrote all the songs for the album. The rest of the group plays, sings and talks in a great diversity of sounds and genres. Put together, their record is original, if somewhat rough around the edges, and contains highlights like music videos by Bebop Record or Phoenix (Il y aura un matin). Just like the planet-shaped egg on its cover, the record stands out. Alternating between jazz, pop, classical music and hip-hop, it is out of place and anything but mainstream. But niche media—from Inrocks to Télérama and Brain—love it. Even better, Catastrophe has the blessing of the king of French pop, Étienne Daho, who promoted them during his exhibition about French pop. All this support benefits the collective, but simultaneously places them in a subculture where people talk about jazz, Henri Michaux and poppers. This is also the impression they make, here, at the Badaboum, where Yelle has just started performing. The walls start to vibrate to the sounds of "Je veux te voir" and Blandine, Pierre, Bastien, Mathilde and Arthur seem to be weightless in this space filled with candles and oriental sofas. "Is Catastrophe elitist?," I ask. "Good question," laughs Blandine, who is amused. "I did a workshop with some high-school kids and one girl said to me: It's really interesting, but I can't read it." Arthur replies: "We are trying to go towards more immediateness. This is what we were trying to communicate with our TED talkx, dedicated to moving more slowly and the beauty that brings. It's quite simple, actually. You don't need read Anne Dufourmantelle or Dostoyevsky to understand." Blandine goes on: "The question is how to talk to people in the most simple way possible without treating them like idiots." Pierre decides: "I think it's also immaturity on our part. One day, we will have something very simple, very clear, very accessible." Bastien, who has barely said a word up until now, tells us he's proud to be part of the collective. He replaced the previous drummer and will probably join the tour in Germany and Austria. He lights a cigarette and confesses: "I feel alive right now. I've played in many bands, but I've never worked with such professional people before. Pierre is a very meticulous musician, as well as being very talented." It is strange to hear this, since as a collective they mostly reject their individual identities. It proves that even Catastrophe seems unable to fully avoid a hierarchical structure. As a couple, Blandine and Pierre clearly appear to be the main composers. They are also the ones who have done most of the thinking and planning for the project for a long time now. When she joined Pierre to go to London for his courses at King’s College, Blandine was already writing for quite a few newspapers, among which (Gonzaï, Le Matricule des Anges and Citizen K.). In 2017, she published her first book under her own name. The abandonment of pretence (nominated for the 2017 Prix du Premier Roman) is about her mum, who took in refugees in a dead-end street in the town of Rezé in Loire-Atlantique. When the night is still young begins with the words "We grew up in a dead-end street". "You shouldn't take it at face value. It doesn't mean that the French youth is stuck", Blandine confides, to avoid misunderstandings. Catastrophe doesn't deliver any universal message and their work is based on lived experiences. Illusion to the end of the night. "In politics too, it's potentially dangerous to believe that anything is universal, " says Blandine. After going through all the ideas in When the night is still young, it is difficult not to talk about engagement and politics. A certain philosophy hovers over their work ever since the article was published. Even if the book doesn't have an explicit political orientation, it's still possible to read between the lines. When asked what, according to Catastrophe, the difference between the political left and right is, Blandine, slightly annoyed, answers with raised eyebrows: "Well, this isn't a right-wing celebration." She then elaborates: " Being left means to help someone 'who has one knee on the ground'," borrowing from Benoît Hamon. On the contrary, being on the right means "giving him the final blow." Later that evening, Catastrophe is ready to perform. The Balajo is nearly full when they go on stage. The atmosphere lively as the reflections of the disco balls crawl over the walls. Like a music video, but without the sound, Blandine moves her hips in her dark blue outfit, Pierre leans over his piano, Mathilde sticks her chest out as she sings along, Bastien hits his drum kit methodically and Arthur parades in his white suit. The evening ends in the usual hubbub with the closing of the curtains. Hadrien murmurs something in Blandine's ear: "Some people told me we were upsetting." The time it took for us to collect our belongings and make our way to the exit and out into the street was enough for Catastrophe to disappear into the night. Like in a distant dream.